Retro Roadhusband and I had an absolute blast yesterday in some uncharted territory less than 2 hours away from Retro Roadmap HQ. We hit so many places that I want to let you all know about that I’ve compiled them into this humungus post laden with vintage and retro places to check out, so you too can have as much fun as we did! The promise of breakfast is what lured Retro Roadhusband out of bed early on a grey Saturday, so I knew it better be something good – if not in quality then in quantity. 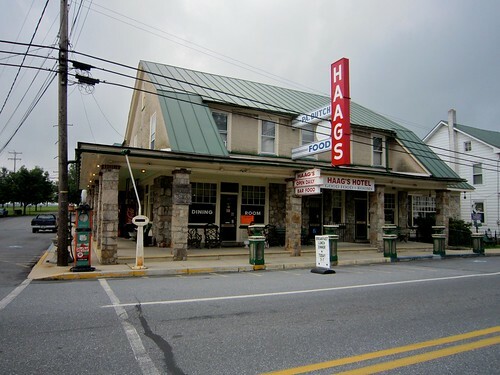 We got a little bit of both AND a heaping portion of vintage ambiance at Haag’s Hotel & Dining Room in Shartlesville, PA. Built in 1915 Haag’s Hotel is in its 7th generation as a family owned business. 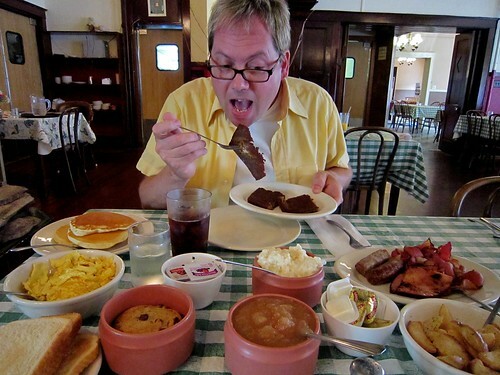 While their website indicates they do technically have some hotel rooms for rent, it’s probably more well known for its PA Dutch breakfast that includes “15 or more dishes from which you may eat all you can” – do I know how to make Retro Roadhusband happy or what? While RRH was busy seeing if he could eat ALL that scrapple (yep. He did.) 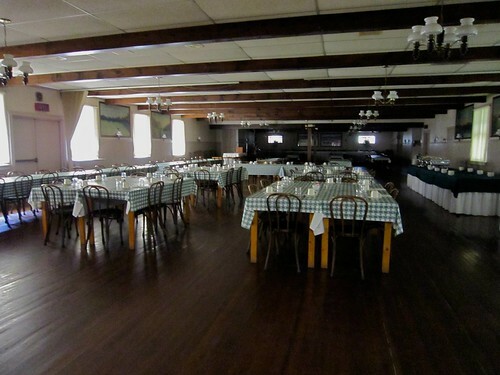 I ate my fill of bacon and then was off snapping photos of the grand interior, which can seat up to 350! A couple of notes, so you’re in the know. Don’t be surprised when you enter the door on Main Street that you’re directly in the bar – the dining room is just through the door and they’ll seat you right away. 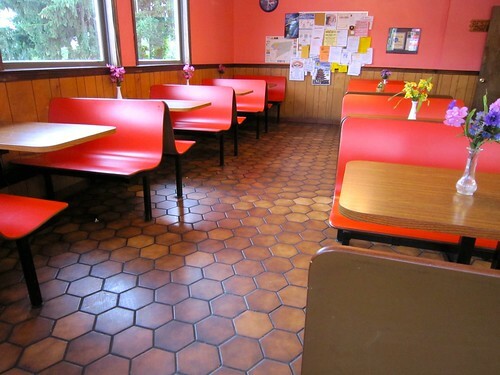 This actually gives you a good opportunity to see the great marble sided wooden bar and vintage tile floor. Also, while “15 dishes” sounds like a lot, they actually consider things like butter, jam and applesauce part of that, but still at $8 a person it’s a bargain. Just don’t expect anything fancy and you’ll be all set! As regular readers know I’m positively smitten with the roadside attraction Roadside America (and if you didn’t know that, read my post on it right here) and while we didn’t have time to visit it again, I sure as heck made sure we had time to stop in their equally fab gift shop, the Pennsylvania Dutch Gift Haus which has been next door for over 50 years, and is just moments down the road from Haag’s. 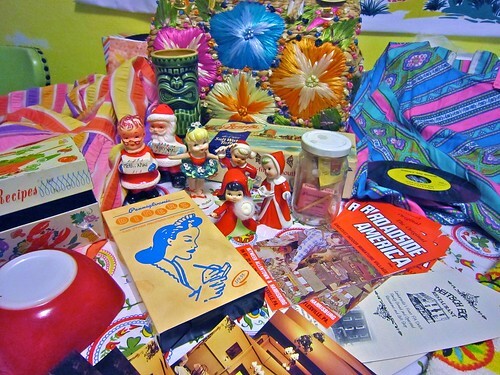 I can’t help myself when I see ticky tacky souvenirs, hex signs and other “evidence of fun had” – so I just had to pick up a few little somethings – happy birthday to me! In speaking with the owner of the shop, she told me the history of that fabulous straw bag- and the others that were on display. She explained that she and her mother used to go to Nassau in the Bahamas and pick out the prettiest bags and hats they could find, but then just took them home and stored them away. Her mom is now passed, and so she figured she’d bring the bags to the shop to sell. Not PA Dutch in the least, but my “Amish Hex Sign towel with top crocheted by the owner” balanced out my purchase nicely. While Retro Roadhusband dozed off in a food coma, I decided to drive north, as we seemed close enough to Pottsville, PA to make that our destination. 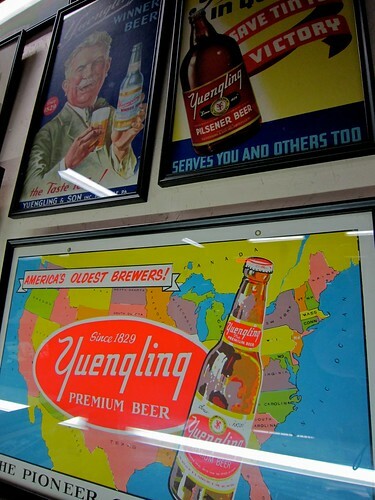 Looking at the clock we realized that if we hustled we’d make the last tour of the Yuengling Brewery in Pottsville, so we parked (on a hill, natch) donned our closed toed footgear, and joined about 50 other folks as we tromped around the country’s oldest brewery. 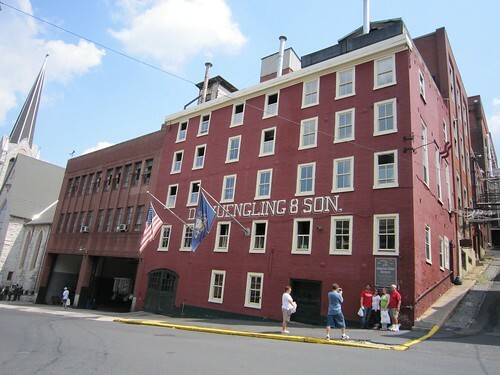 Established in 1829 it’s still family owned and operated, located just in downtown Pottsville. It was good we had sensible shoes on, as our hour long tour took us through the damp dank slippery caves and up multiple stairways into the hot factory, and for our tromping were rewarded with a view of the beautiful stained glass ceiling and a sample of beer at the end, much to Retro Roadhusband’s delight. While I had more pins on the map north of Pottsville we knew we had to head home to Retro Roaddog. But that didn’t mean our return trip wasn’t laden with places to stop! 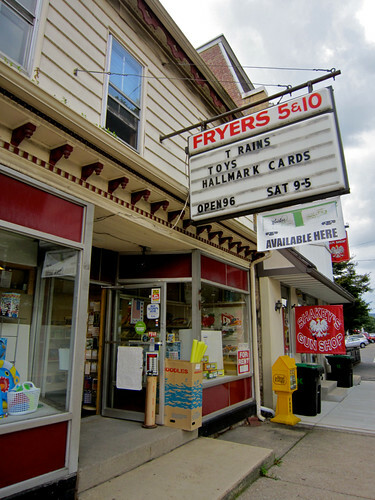 Our first stop was Fryer’s 5 & 10 store which has been in Orwigsburg PA since 1954. Tiny and immaculate – LOVED the gleaming wood floors, the 5& 10 type merchandise was augmented with a healthy selection of craft goods and a large selection of greeting cards. Model trains get their own little room. We would’ve stayed longer had Retro Roadhusband not heard the Emergency Broadcasting Alert on the radio playing in the store, notifying us of gusty winds and torrential rainstorms heading our way. Yikes! But I’m glad we stopped in if only for a minute, so now you folks know about this cute little family owned place. 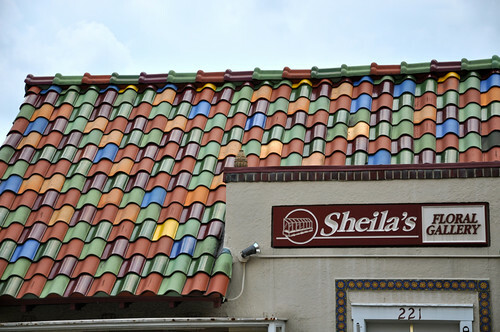 We have a tile roof on the Hacienda, I would love to have it look as colorful as this! Since we were scurrying from the storm I didn’t get to stop in and ask the history of it, but for now, ain’t it interesting? I want to spend MUCH MORE time at this next location, but the storm was bearing down on us – and they were closing up by the time we arrived. 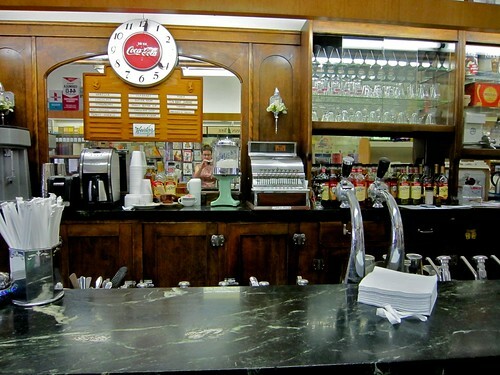 For now I’ll tell you if you want a soda from an authentic soda fountain located in an actual downtown Pharmacy, Adams & Bright in Hamburg PA is the place to go. Even tho we rolled up at 3:59 not knowing they closed at 4, the gals behind the counter were as pleasant as could be as they got our ice cream soda together. I’m going back here to do a more in-depth report, but for now, this post gets this gem on the map, and in your brain! 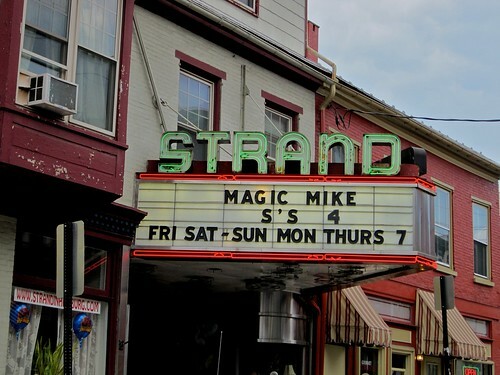 Also around the corner from Adams & Bright is the historic Strand Theatre! OBVS we didn’t have time to stop in to this 1920s era theatre, but man, is this area shaping up to be a Retro Roadmap Weekend destination or what? I’m plotting one, people, I swear! OMGz I love 5 & 10 stores, and since the alleged rain had yet to fall, I insisted we stop in. 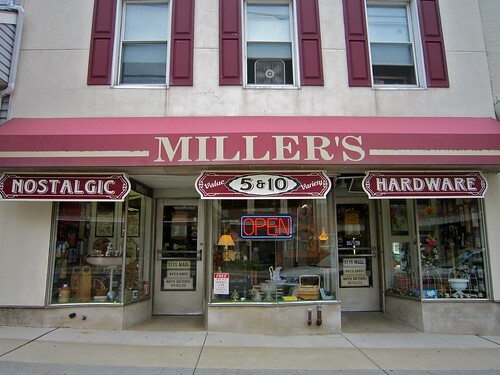 This is a great combination of vintage 5 & 10 store with all the useful things you’d need, with an assortment of second hand, antique and collectible items located in the back. I was in heaven, and had to pick up a few random things, while Retro Roadhusband was thrilled to find the world’s largest back scratcher! Our pal John Young would be thrilled to note that you can buy an ice cream here, for a wooden nickel. I was completely pushing my luck at this point with the rain, but since it had yet to fall and we really hadn’t eaten anything since that ginormous breakfast 6 hours ago (a shared icecream soda doesn’t count! 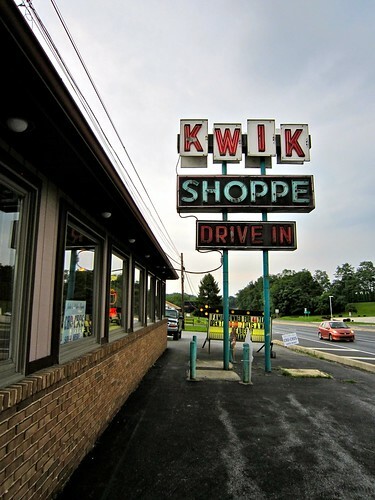 )- we made a quick stop at the Kwik Shoppe in Shoemakersville for a bite before heading home. 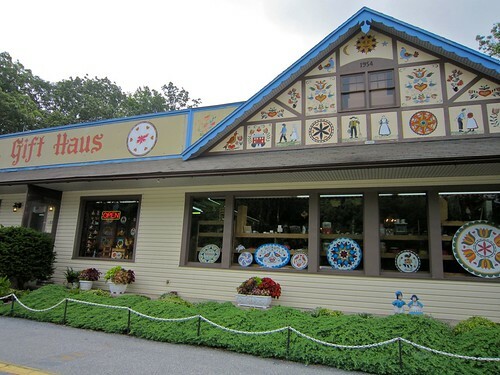 I had heard about this place from WendyVee of Roadside Wonders when she wrote about it last year on HER visit to Hamburg! 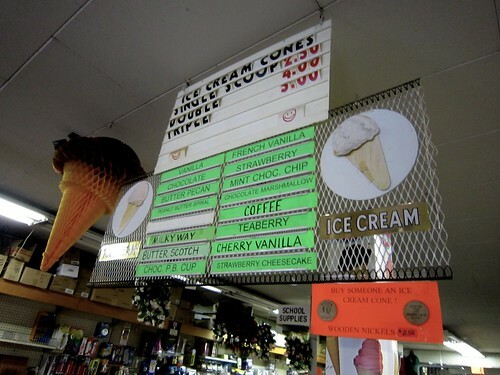 The sign outside states that this independent fast food / ice cream stand has been family owned and operated for the last 44 years and is open 7 days a week until 10pm. 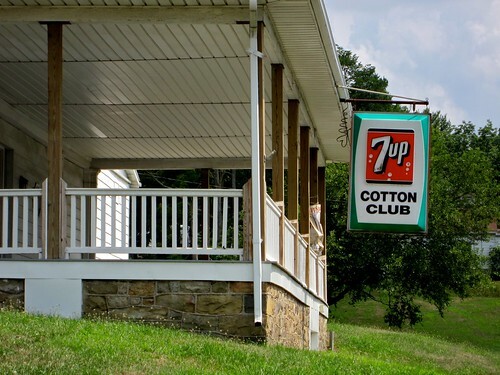 My kinda place! I also liked the cheery orange interior – especially with how gloomy it had become outside. While we HAD TO get burgers (and fries! ), after just being in Hamburg, we also saw a sign in the window proclaiming they were serving old fashioned cho-chos, and being the adventurous types with no regard to our waistlines, we got one, so we all would know what the heck a cho-cho is. 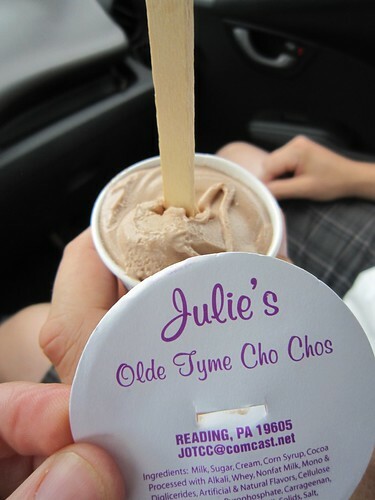 It’s kinda like frozen chocolate malted milk, in a dixie cup, eaten with a popsicle stick. We thought maybe you could eat it off the stick like a popsicle and this post seems to indicate that’s how they should be eaten, but by the time I photographed it and we figured out what it was, it had gotten too melty to do that. Eating it off of a wooden popsicle stick brought back memories of eating Hoodsies growing up, so it was all good. And that was it. 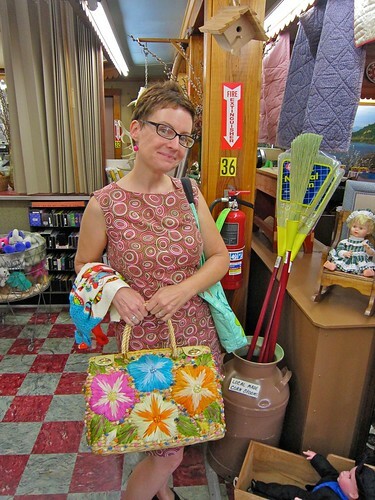 OK well maybe I did coerce RRH to stop at another thrift store or two, but then we indeed needed to head home. 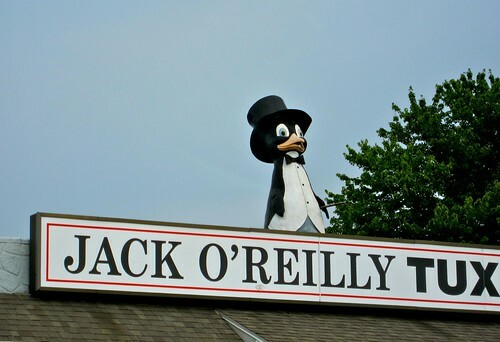 But the Girl Can’t Help It, so while we waited in traffic in Reading I snapped a photo of this dapper penguin perched atop a Tuxedo Shop. Now you’ll know he’s there when you take YOUR Pennsylvania Retro Road trip! I’ve put all these places we stopped as well as these little photo ops, on the Pennsylvania Retro Roadmap. PreviousPennsylvania Retro Roadmap Mega-Post – What a Fun Road Trip! Photos Galore.